We’re writing today to make you aware of some improved support offerings we’ve introduced recently. About 4-years ago we started our first annual support plan, which we’d later brand as “OrangeCare”. The OrangeCare support plan provided 30-minutes of setup and break/fix support per user, per day so a team of six could receive up to 3-hours of technical support each day. The advantage of OrangeCare over plans offered by Swiftpage was simple. We provided support for the entire Act! eco-system, including add-ons like Handheld Contact, which delivered a much more comprehensive support offering to our customers, and eliminated the need to purchase support packages from other add-on vendors. Over-time we added additional value to OrangeCare with free Act! Training Units, and this month we increased the value further with a free license of Primary Contact Plus, which is an add-on that we developed to dramatically improve your account management within Act!. With all these perks, we think our latest addition to the OrangeCare family is the most exciting. We’ve taken all the perks of OrangeCare, and added the power of custom tables to form what we call OrangeCare Plus. 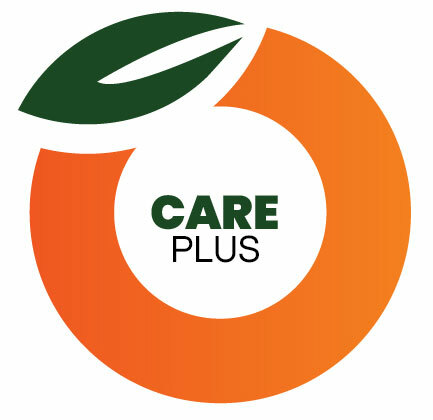 OrangeCare Plus is designed to deepen the support experience, while enrichening customer’s database’s with the value & efficiency of custom tables. Custom tables unlock the full potential of Act!, providing maximum adaptability so you can bring complex data sets, unique business processes, and specialized industry practices together in Act!. Our Tables4act addon is the exact same custom table technology used in Act! Premium Plus. We know this because we wrote it for Swiftpage. Enjoy a no compromise custom table experience at a fraction of the cost when you purchase OrangeCare Plus. With all the value of OrangeCare & OrangeCare Plus, it’s important to understand what it isn’t. 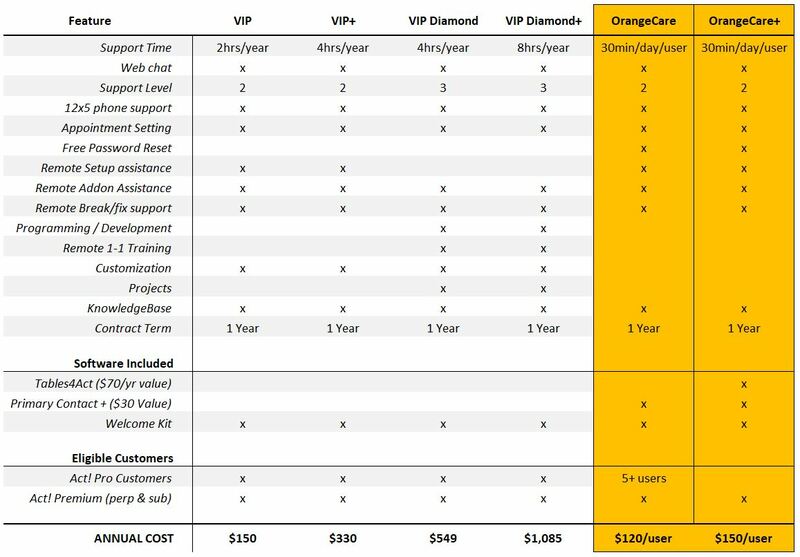 OrangeCare cannot be used for customization work on your database, nor can it be used for project work, consulting, development, training, or level 3 service involving more complex work such as database repairs, migrations, imports/exports, conversions, report building, and advanced troubleshooting. For these services we offer our VIP and VIP Diamond support packages, which are blocks of steeply discounted support hours that must be used within a one-year contract term. To understand how the plans differ, please review the following comparative chart.